Wishing this community a very Happy Birthday! Our beloved Team-BHP has now spent 14 valentine's days with us . Team-BHP is all grown up and with maturity comes…responsibility. Which is why, today, we introduce our very own & dedicated ROAD SAFETY section. Anywhere between 23 - 27 lakh unique visitors read Team-BHP every month & we're certain that our new safety forum will contribute to better motoring in India. It's about time too. A whopping 1.5 lakh unfortunate souls lose their lives on Indian roads every year, and that's just the official number! Even the government has woken up to this harsh truth, with crash tests & safety equipment for Indian cars soon to become mandatory. Just as we have become for cars, I hope that Team-BHP also emerges as the definitive destination for knowledge on road safety in India. We already have tons of safety advice, but its scattered all over the forum (in different sections). Having it organised in one place will make a far greater impact. Road Safety has been given a top position on our forum homepage, thereby emphasizing its importance. Road Safety: The parent forum which will account for an overwhelming majority of discussions. Everything from crash tests & understanding ESP to manufacturer-backed safety initiatives & government regulations will be found here. 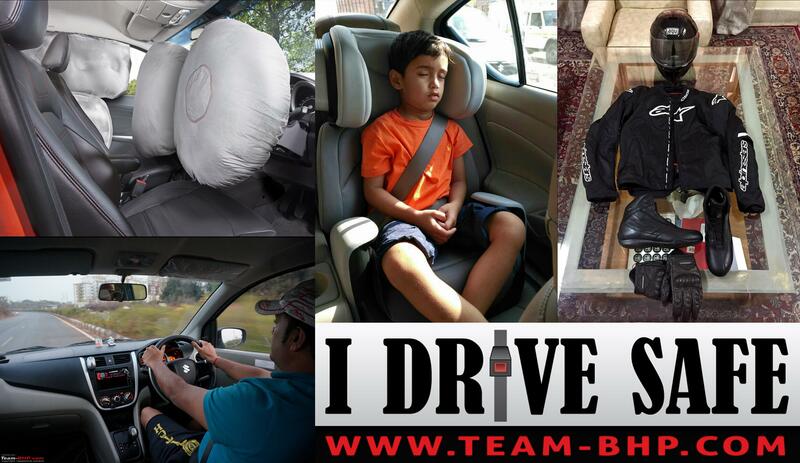 Drive Safe: The sub-forum where we will discuss best practices on safe driving. Ride Safe: The sub-forum for everything to do with safety on 2-wheels. P.S. We've started moving safety threads to the new section & will continue doing so over the coming days. If you should find any discussions that need to be moved, please 'report those threads' and we'll have them relocated. Last edited by GTO : 14th February 2018 at 00:08. The only way we can truly improve safety on our roads is by improving infrastructure & education. If an article or piece of advice prevents even just 1 incident in its whole lifetime - it's been more than worth it. Let's use this section to educate ourselves & others around us. Last edited by Rehaan : 14th February 2018 at 00:16. Happy 14th on the 14th of Feb! Road Safety Forum is a great initiative indeed. Team Bhp has always set examples when it comes to safety related concerns like crash tests, road rules, riding gear in pictures etc and having a dedicated forum would certainly help spread the message across to a larger audience. Congratulations team. And a very happy birthday Team-BHP! The impact that the TBHP forum and its members have had on the Indian motoring community over the past 14 years is unmatched. Hoping the new Road Safety section will further spread the need and importance of being a responsible road user, something we are deeply in need of! What better way to celebrate our beloved forum's 14th birthday, on Valentine's Day, than present us with such a wonderful gift! As a pioneer in all things automotive, this is a fantastic initiative by our Admins and Mod team to build and prioritise an entire section devoted to Road Safety. Hopefully, as responsible BHPians, this will help us keep ourselves, our loved ones AND the ones on the roads who are equally loved in turn, by their families & circles, safe. Last edited by RavenAvi : 14th February 2018 at 00:18. Reason: added a word. A wonderful initiative and I am glad to be tiny part of this great forum. Over the last 2 years, I have seen the way people look at safety... From driving with a child on the lap and not using a helmet on bikes to belting up in the car and choosing a car with airbags over the touchscreen system. I hope that we, as the leading automotive forum in the country, can spread the message of safety to all the corners of India and beyond. And change begins right from home. So I will promise to convince my family members and friends for belting up inside the car and wearing helmets on 2-wheels and being a role model for our next-generation. Last edited by blackwasp : 14th February 2018 at 00:19. Congratulations to all the people behind this initiative. I am sure it will be indeed a precious gift for many years to come. Many thanks for starting the dedicated forum and that too in style, on the birthday! A very happy birthday, Team BHP! Happy Birthday Team! Starting a new section for safety is indeed a smart and meaningful move. Congratulations to the mods who have managed the quality of the forum since fourteen years and came up with this idea. I sincerely hope together we motorheads succeed to spread the talk about road safety. Happy birthday to one of my fondest offspring! Team-BHP has never ceased to amaze. Happy 14th Birthday Team - Bhp!! The ‘Road Safety’ forum is a superb initiative!! Considering the number of visitors Team - Bhp gets, this new forum will definitely help to increase road safety and awareness for both, the riders and drivers. Congratulations to all the moderators for maintaining and upholding the quality of the site for fourteen long years and also for shaping and developing Team - Bhp to what it is now. Last edited by Prathiiik : 14th February 2018 at 01:03. Wishes to let all know that we care and wish u all the best in your journey. A section on safety is an excellent idea. Hope it becomes a most visited part of the forum and gets people thinking hard about safety and subsequently influences them to adopt atleast one safety measure. Happy B'day Team-BHP! Its a great gift - well thought out and much required. In the near future, if a customer can buy any car from any segment without worrying about safety, the role played by Team-BHP for that will be immense! And this dedicated section has given that motion a supercharger now. Heartiest birthday greetings to this wonderful forum. A huge bow to the mods and all the contributors to making this forum a truly one pit stop for anything on automobiles. Cherry on the top is the due importance to safety with a new section exclusively to ensure safer roads for safer rides. I am sure the new section on safety will be the most viewed one by BHPians as wells as the guests. One more feather in the T-BHP cap. Keep the fantastic and good work Mods. Happy B'day to all of us as a community, it's a journey that all of us are in together. Team BHP initiatives never cease to amaze us, this new GIFT on ROAD safety is indeed the need of the hour for all of us. Last edited by volkman10 : 14th February 2018 at 08:24. All times are GMT +5.5. The time now is 04:13.